I can't even tell you guys how much I love my Vitamix. I use it for about 90% of my food now and it makes me so happy. It came with a recipe book that I skimmed through for like 2 minutes on Christmas morning before I tossed it into the cupboard. But there was one recipe in there that was an orange sorbet. 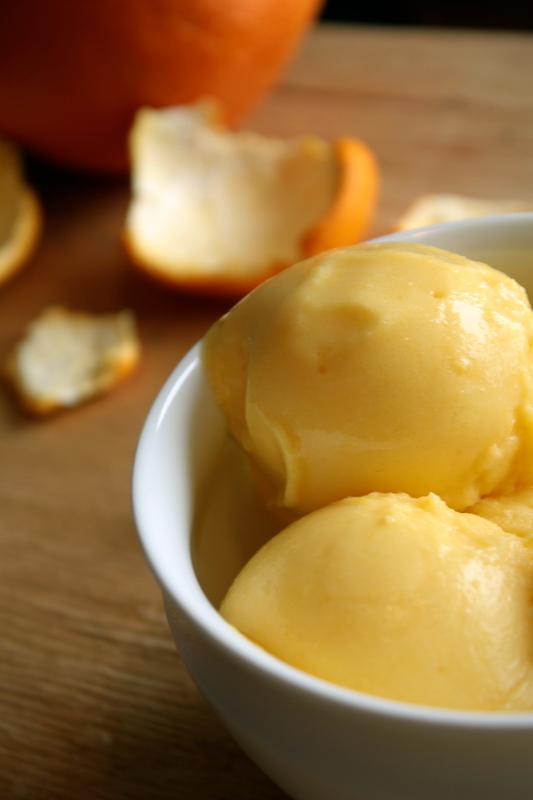 I didn't like it that much though and decided to put my own twist on it to present Orange Creme Sorbet! It's exactly what the title says, orangey, creamy, and a little bit chilly but that's totally okay. It's more than okay if you make this after a nice long yoga practice or a sweaty gym run which I totally recommend. Actually double up this recipe (you can thank me later) because once you make it you'll be wanting more. I made two servings just yesterday and gulped them down in a hurry. It might happen again later this evening and no ones gonna stop me! Anyways, let's get to the recipe so that we can take a moment to appreciate how lovely oranges really are.